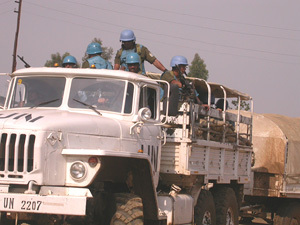 Military operations conducted in the troubled northeastern district of Ituri by the Congolese army, with the support of the UN Mission in the Democratic Republic of Congo (MONUC), are counter productive as they have contributed to the worsening of the security situation in the district, according to a report by the Forum on early Warning and Early Response (FEWER-Africa). "Just recently in northeastern DRC, one UN peacekeeper was killed and three wounded during a firefight with a local militia, with seven other peacekeepers still missing," FEWER said in a statement issued on Tuesday. "The situation in Ituri indicates that there is still a risk of renewed conflict in the region, either before, during or after elections [set for 30 July]." However, MONUC said FEWER's report did not take into account the reality on the field, "because to this day there are only 2,000 local militia in the interior of the all the country and some 1,500 to 2,000 foreign combatants after the voluntary demobilisation efforts led by MONUC," Jean-Tobbie Okala, the deputy spokesperson for MONUC, said on Wednesday from Kinshasa, the DRC capital. "We have voluntarily disarmed more than 14,000 foreign combatants who returned to their country, and inside the country around dozens of thousands of militia have surrendered their arms," he said. Okala said: "We acknowledge that there is still instability in the east, we have never denied that security in the east is a preoccupation for the international community. The militia and foreign combatants who remain cannot sabotage the holding of the forthcoming of elections in Congo." He said the country's Independent Electoral Commission had successfully completed voter identification and registration countrywide and had conducted a referendum on a new constitution in December 2005, in which a majority of the voters had voted 'yes' to the document. FEWER's report, titled Elections and Security in Ituri: Stumbling Blocks and Opportunities for Peace in the Democratic Republic of Congo, calls for the harmonisation of "local level realities in the east of the country with the national peace process". The report provides a current analysis of the political, judicial, humanitarian and security situation in Ituri. FEWER said of the root causes of conflict in the country was lack of good governance at local and national levels. "However, this 'accountability’ deficit cannot be fixed in a security vacuum," FEWER said, adding, "as the Congolese government and the international community focus their attention on the upcoming elections, the underlying question is how to resolve conflict after elections." The 30 July general elections will be Congo's first democratic polls in 45 years. FEWER said the DRC has been marked by "structural" failure at all levels, a situation that has been exacerbated by civil and regional war, which has led to the deaths of at least 3.5 million people and the displacement of millions others. "The initial excitement of a new political dispensation before, during and immediately after the elections can easily be a curse in disguise, as elections are only one small part of the democratic process," FEWER said.